Come parte del mio coinvolgimento nel mondo Food Design, e in quanto fondatrice della International Food Design Society, ho proposto una categorizzazione delle sotto-discipline del Food Design che crei una visione d’insieme delle conoscenze di base attraverso cui il Food Design può essere affrontato, e che mostri come diversi prodotti e servizi provengano da designer con conoscenze e competenze diverse, vale a dire con un background differente. Il Food Product Design è più vicino all’idea del designer come parte intrinseca di un processo industriale. Nel Food Product Design il cibo è il materiale, come nel Design with Food, ma in questo caso i prodotti commestibili sono solitamente progettati per la produzione di massa. Un esempio di Food Product Design sono le Pringles, un disegno chimico-fisico-morfologico dove la patatina ha una forma ergonomica perfetta per la lingua, rilasciando il suo sapore e migliorando l’esperienza di degustazione. Queste chips sono progettate non solo per creare una forte esperienza gustativa, ma anche per farla durare il più a lungo possibile. Un altro esempio molto interessante di Food Product Design è la Cookie Cup di Lavazza, disegnata da Luis Sardi per la 1° Food Design® competition nel 2001. La Cookie Cup è una tazza per il caffè espresso fatta di pasta, con uno strato interno di zucchero a velo, che funziona sia come un isolante, rendendo la coppa impermeabile, che come dolcificante del caffè. As part of my involvement in the Food Design world, and as founder of the International Food Design Society, I have personally proposed a categorization of the Food Design sub-disciplines that create an overview of the background knowledge from which Food Design can be approached, and show how different products and services come from designers and professionals with different knowledge and sets of skills, i.e. a different background discipline. This categorization does not aim at setting once and for all the different facets of Food Design, but is instead a first approach towards the understanding of the complexity of this discipline. The aim is to show how food designers may approach this discipline, depending on their own background knowledge. Nonetheless, this is open to debate and more importantly, further interpretation. Design With Food is the design that melts, swells, blows, foams and reassembles food as a raw material, transforming it to create something that did not exist before in terms of flavour, consistency, temperature, colour and texture. Design With Food is about the manipulation of food itself, and considers only the food itself as the material to design with. The food designer in this case is usually a chef or a food scientist. An example of Design With Food is Èspesso by Ferran Adrià and Lavazza. Èspesso is a coffee lighter than a mousse but firmer than foam. Ferran Adrià played with the consistency of usual coffee to create a new way of drinking espresso. Another example by Ferran Adrià is the Fruit Caviar, a product that looks like caviar, but tastes like fruit, thanks to a technique called sferificacion designed by Adrià himself. This technique is attributed to Molecular Gastronomy, of which Ferran Adrià is the father. Design With Food produces experiences that reinvent the idea of food itself by twisting visual and taste expectations through surprising textures, temperature, colours and smells. Design For Food is the design of all the products designed to cut, chop, mix, contain, store, cook and preserve food. The packaging, for example, is not only the container, but also the means to communicate the product, make it recognizable, and protect and transport the food product. One of the most successful examples of a product that is identified by its container is proposed by Coca Cola. The silhouette of the glass bottle is a successful symbol that has made Coca Cola recognizable since 1886. The Coca Cola bottle is an example of how Design has been applied to food, and drinks, for longer than the use of the two words Food Design. Food Space Design or Interior Design For Food is about the design of food spaces considering all the characteristics of the eating environment or food environments such as interiors, materials and colours, lighting, temperature and music. Interior Design For Food is the design of interiors of food spaces such as for examples kitchens, bakeries, patisseries, bars and restaurants. In this category, as in Design For Food, food is not the material to design with, but many of the consideration and knowledge necessary to design an eating space are about food: from food preparation, for an understanding of the better material to design a work top with, to the dynamics of the eating experience, in order to be able to design the correct light, temperature and colours for a specific eating environment. Food Product Design is closer to the idea of the designer as inherently part of an industrial process. In Food Product Design the food is the material itself, as in Design With Food, but here edible products are usually designed for mass production. An example of Food Product Design are Pringles, a chemical-physical-morphological design where the chip has an ergonomic shape that perfectly lies on the tongue, releasing its flavour and enhancing the tasting experience. These chips are designed not only to create a strong flavour experience, but also to make it last as long as possible. Another very interesting example is the Cookie Cup from Lavazza, designed by Luis Sardi for the 1st Food Design® competition in 2001. Cookie Cup is a cup for espresso coffee made of pastry with an internal layer of icing sugar which works as an insulator, making the cup waterproof, and sweetening the coffee at the same time. Design About Food is the design of objects inspired by food. In this sub-discipline food is not the material itself, instead, food is used to emphasize, reinterpret or inspire the product’s message. An example is a line of T-shirts packaging designed by Prompt:\Design, for which they won a Gold Pentawards 2010. Here food is not the material, the product is nor edible, it is not design for food, but still food is the inspiration. And finally Eating Design is about the design of any eating situation where there are people interacting with food. This is a very broad definition that explains that restaurant-eating-situations, the ones that usually first come to mind, are only one option: eating situations can also be eating popcorn at the cinema, having a picnic in the park, eating a sandwich while walking to work, or any other situation which includes people and food, with no restriction on any other aspect like environment, companions and service (or absence of such). An example of eating situation is the last course presented to customers at Combal.Zero: a bag containing chocolate candies and a Campari Cyber Egg tied to a helium balloon. Davide Scabin, head chef at the restaurant Combal.Zero was the first chef to serve laughter at the dinner table. Even though it is in a restaurant context, this example is definitely more than a dish, and becomes an eating situation because it considers also aspects that are ‘outside the dish itself’: the helium balloon as a vehicle for laughter, fun and the freedom of behaving childishly. An eating situation which is not related to the restaurant environment and which also shows how eating situations can range, is designed by Marije Vogelzang who is probably the most well known eating designer. Determined to find a way to make her daughter eat vegetables she organized a Veggie Bling Bling party for her and her friends, asking them to make jewelry using only their teeth. Without realizing it, and having a lot of fun, her daughter ate carrots, tomatoes, lettuce, radish and much more. 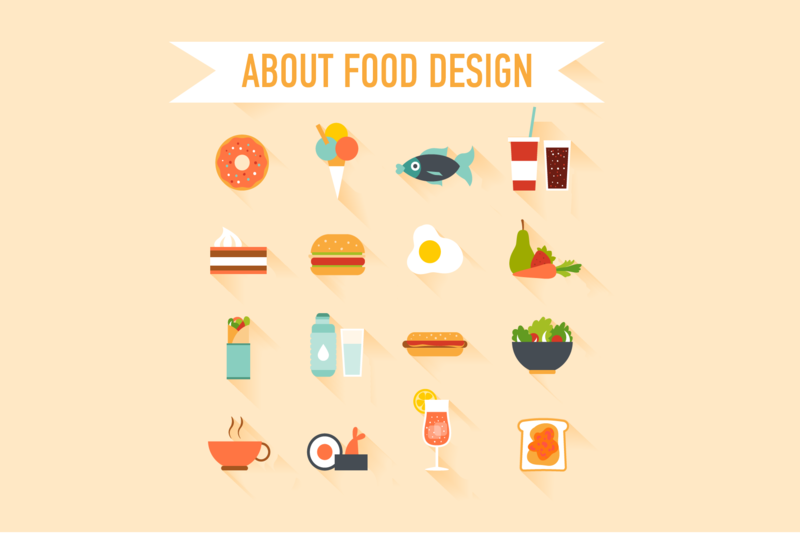 This categorization of the Food Design sub-disciplines helps better understanding how big the Food Design world is, and how many different types of skills are involved in designing everything that is in and around food as well as the eating situation.